CHICAGO (WLS) -- Chicago-based Boeing has released artist's renderings for their planned Boeing 777-9X, which is expected to be the world's largest twin-engine jetliner. 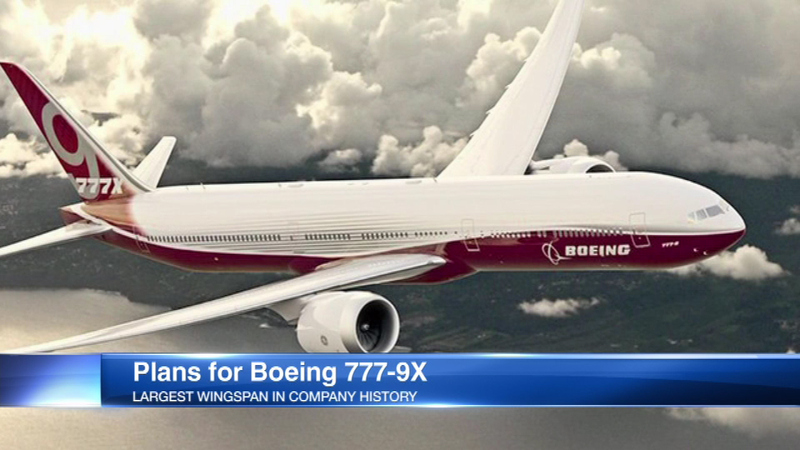 The plane will have the widest wingspan of any plane in Boeing's 99-year history, measuring 235 feet and five inches. The wings are so long that they'll have hinges allowing them to shorten while rolling across airport taxiways. The giant wings will give the plane extra lift, similar to that of a giant sailplane glider, and that means big fuel savings. The wings will help save 12 percent more fuel than the Airbus A350. Prototype testing is expected to start soon, Boeing officials said. Production is expected to begin in 2017. The first planes could enter service as soon as 2020. Six airlines have already placed orders for a total of 320 jets.